I wrote Carl’s war story that appeared in the Sun five years ago. Out of the blue the Heron Creek Golf and Country Club resident called recently and invited me to fly with him on “Witchcraft,” the only B-24 still flying. It’s part of the Collings Foundation’s “Wings of Freedom Tour” that flies from airport to airport throughout the United States and stops annually at the local field. 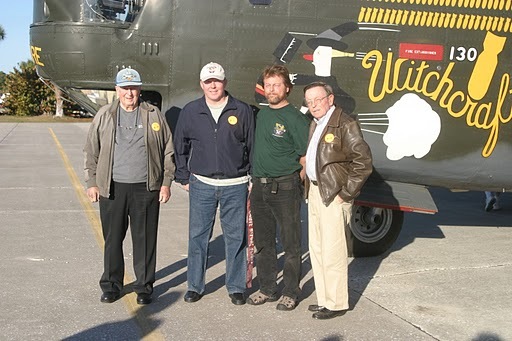 Accompanying “Witchcraft” was “Nine O Nine,” a B-17 “Flying Fortress” and “Betty Jean,” a P-51 “Mustang.” The foundation’s purpose is to promote living history. Parked on the navigator’s seat behind the copilot, Carl watched intently as the pilot and copilot worked through a preflight check list as all four 1,200 hp. Pratt & Whitney engines pulsated while the 50,000 pound bomber sat motionless waiting for their command. “All week long I’ve been thinking about the flight checklist we went through before taking off. These guys did everything right,” the 86-year-old former B-24 pilot observed while watching Jason Owens, the 50-year-old Alaskan pilot, go over the list. As the bomber taxied toward the runway, Kristie Wolff, the plane’s flight engineer, closed the bomb bay doors and the ground disappeared under my feet. I was sitting on a seat attached to the bomber’s floor with my legs dangling in the slit leading to the bomb bay catwalk. Sitting beside me, in what would have been the engineer’s seat, was Bill Citron, Carl’s son. He had flown down from Chicago to accompany his father on this once-in-a-lifetime aviation adventure. The massive bomber began rolling down the runway as her four engines grew ever louder. Everything in the B-24 vibrated as “Witchcraft” gained air speed and her wheels lifted off the concrete runway built in the 1940s for bombers like this. 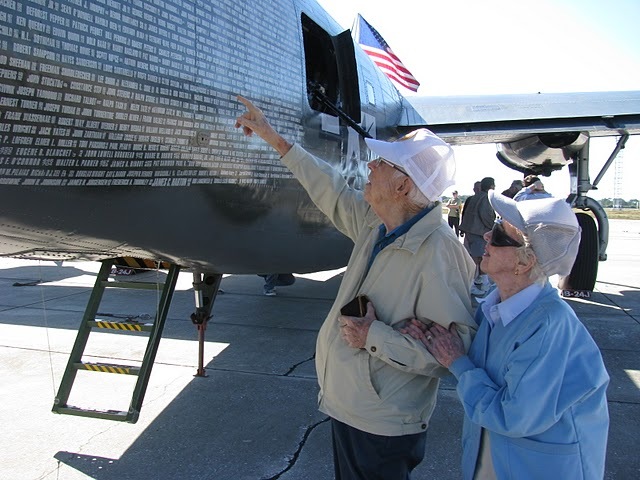 “It was 65 years ago that I last flew in a B-24 over Germany. I was a 21-year-old 2nd lieutenant in the 8th Air Force,” Carl yelled over the engines roar as the bomber climbed into a cloudless blue sky and turned in slow motion toward Venice Beach and the placid Gulf beyond. Carl was mesmerized as he stood in the cockpit door watching Jason and the copilot flip switches and pull back gently on the four black-handled levers controlling the engines’ throttles. I crawled through a passageway under the cockpit to the bombardier’s perch in “Witchcraft’s” Plexiglas nose. On a seat hunched over a Norden bomb site I watched the Venice panorama glide by under my feet. Over the houses with their red, white and gray tile roofs we flew. Over the streets, bridges, golf courses and waterways we flew. Over Venice Jetty we flew as a tiny fishing boat raced down the slip into the open waters of the Gulf. Sitting there like the ghost of a long ago bombardier, it wasn’t hard to close my eyes and envision I was flying with Carl on a bombing run over Berlin with 2,000 other B-24s and B-17s. It’s April 1945, he and his youthful crew were on a mission to flatten the Third Reich’s capital and I was the bombardier. The spell was broken when “Witchcraft” lowered its flaps and began its approach not over “The Fatherland,” but into the Venice Municipal Airport. Jason set the bomber down so softly its giant black rubber tires hardly kissed the runway as dozens of ancient aviators stood behind a yellow rope barrier and gawked at the incoming “Liberator” as it came to a stop. After climbing out of the plane, Carl walked up toward bomber’s nose. On the copilot’s side of the big green fuselage he found a white painted list of bomb groups comprising the 8th Air Force in Europe. He pointed and smiled after locating the 466 Bomb Group he flew with out of Attenborough, 10 miles northwest of Norwich, England so long ago. By this time people were wandering around, climbing over all three World War II airplanes. “Betty Jane,” the P-51 was being readied to take a passenger on the flight of his life in the sleek silver single-engine fighter. Although Carl didn’t see them there, Bob Moore and his wife, Audrey, drove down from Sun City, south of Tampa, to check out the planes and have lunch with him. Moore and Carl flew in the same bomb group during the war. The 94-year-old Sun City Center pilot flew 29 combat missions in a B-24 before war’s end. They caught up with each other several hours later and went to lunch at Carl’s country club in North Port. “How was the flight?” I asked Carl after we landed. “Wonderful,” the old warrior said with tears in his eyes. This story was first published in the Charlotte Sun newspaper, Port Charlotte, Florida on Monday, Feb. 1, 2010 and is republished with permission.